The SSH service needs to run on your Linux Server in order to remotely connect to it. 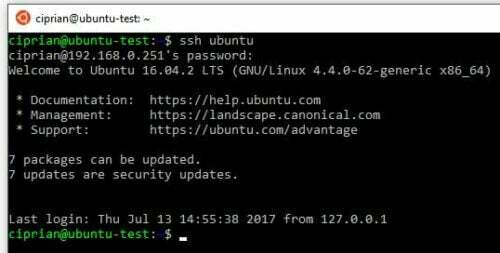 If you haven't installed the SSH server already, you can do it by following our guide on how to install SSH server on Ubuntu Linux. The file is initially empty, so we need to add the configuration. 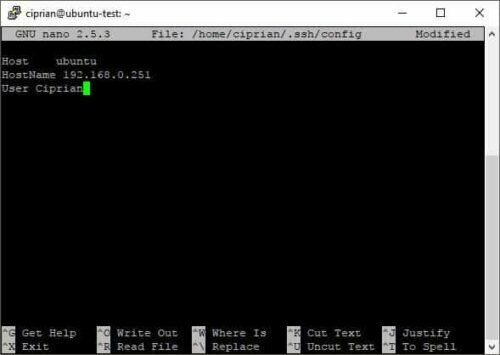 In my example, I configured the SSH server running on my local IP to be called Ubuntu, with the local IP as a hostname and the user Ciprian. In the end, save the file by pressing CTRL+X, then Y to confirm. Host – specifies the alias for the server. Use an easy to remember name for your SSH connection for the server. HostName – specifies the hostname of the server you want to connect to. You can also use the IP of the server if needed. User – specifies the user used to perform the login, when connecting via SSH. Port – specifies the port used to connect via SSH to the server. The default port is 22, but if you are using a different port for SSH, you can specify it with this option. Compression – yes or no values can be used. This option is helpful only if you connect trough a high latency and low-speed internet connection. Usually, there is no performance improvement. IdentityFile – with this option you can specify the file location from where the SSH client can read the key for connecting to the SSH Server. You will notice that the only required information in order to login is the password. After entering the password, you are connected to the SSH Server. Congratulations! You can now save a lot of typing by using a SSH config file. Expand your SSH knowledge by learning how to connect via SSH from your smartphone using JuiceSSH and if you need to connect from a Windows machine, here are 10 best SSH clients for Windows. Check back soon for more SSH guides in the future! How to install PuTTY on Windows?